Marketing Automation is software and processes that nurture leads and convert prospects into highly satisfied customers. By tracking leads from click to close, Marketing Automation allows sales reps to use their time more effectively. With customer intelligence, reps know what content each lead has viewed and actions taken so they are better prepared when meeting prospects and customers. Marketing Automation allows marketing and sales departments to decrease costs and increase profits by automating repetitive and time-consuming tasks, measuring marketing activities, and maximizing marketing and sales efficiencies. CRM (Customer Relationship Management) is a centrally located system that manages data, information, and business intelligence about prospects and customers, such as leads, contacts, accounts, and sales activities. CRM combines processes, technologies, and people to help them better understand their customers. CRM provides the right information at the right place and at the right time for informed business decisions. With this well-managed system, a customer database becomes a greater strategic asset that yields increased revenue and profit with lower costs. Everyone involved with the sale of a company's products gains more value from a CRM system. Sales, marketing, and customer service can all work together and be on the same page with the customer – helping to ensure that nothing slips through the cracks. An integrated Marketing Automation and CRM system brings marketing and sales closer together. Working with the same combination tool, the two departments can more easily and more productively find and keep satisfied customers. I would like to tell you more about Marketing Automation and CRM and how they can work together to achieve mind-boggling results. 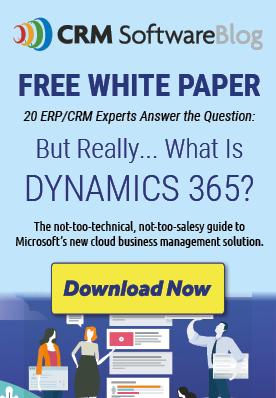 Microsoft Dynamics CRM vs. SugarCRM: How To Know Which Option is Best for You? I have been looking for this kind of solution since a long time. Last year we got a CRM and it really helped managing my clients more efficiently. But I think this marketing automation software will my team further to manage everything with perfection. Brian, I am so glad that you found our blog post useful! If you have any questions about choosing a Marketing Automation Software or pairing it with your existing CRM, please feel free to contact me — 330-929-1353 x 224 I am more than happy to help. Have a great weekend.